Accelebrain is vocabulary builder and flashcard software which helps you quickly memorize words, phrases, vocabulary, numbers, formulas, historical dates, or any subject matter that can be learned via a question and answer format. 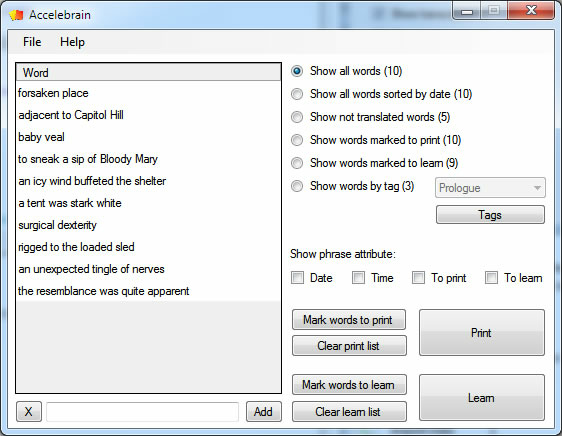 You can add, search, learn and print flashcards with Accelebrain. It supports printing one and two-sided flashcards. A major benefit of the flashcards is that they are extremely portable, comfortably fit into the pocket. If you are standing in the queue at the movie theatre or the mall, you can simply pluck out your cards and kill some time by revising them. You may also learn flashcards with build-in flashcard emulator inside Accelebrain. Why do you need Accelebrain? * To cut down on your learning time and quickly memorize a large volume of words, phases, vocabulary, formulas, etc. * To learn up to 100 words per day with fun * It is vocabulary builder for those who learn foreign language * To prepare for SAT, TOEFL, GRE, GMAT, IELTS, FCE, CAE tests * To print flashcards on paper (one and two-sided flashcards printing support) Features: * Add, collect, search, group, learn and print words * Group words by tags like book, chapter, article, etc. * Print flashcards on the paper. One and two-sided printing * Customize fields which you want to print on flashcard * Build-in emulator of flashcards to learn them in Accelebrain * Free support and advice * Free lifetime updates and upgrades * System requirements: Windows XP/2000/2003/Vista/Windows 7 Download Accelebrain now and start learning new words very fast! This site does not contain serial number, crack, keygen Accelebrain serial number : serial number is the simplest type of crack. A serial number(cdkey,product key,etc) is register the program as you may already know. a crack or keygen may contain harmful software. If you cannot find the exact version you want, just give it a try. for more information read .nfo/.txt/.diz file include in zipped file.